Cook the farro by mixing it with water and salt in a saucepan, bringing it to a boil and gently simmering it for 45 minutes (or a little longer, taste to decide when it’s fully cooked, but don’t let it get mushy). If the grain cooks but there’s some water left, drain it. Otherwise just fluff it with a fork and allow it to cool to room temperature. Make the salad dressing by mixing the olive oil with lemon juice, zest, salt and pepper. Reserve. Add the asparagus and radishes to a small bowl and sprinkle with some of the salad dressing, mixing to lightly coat them. 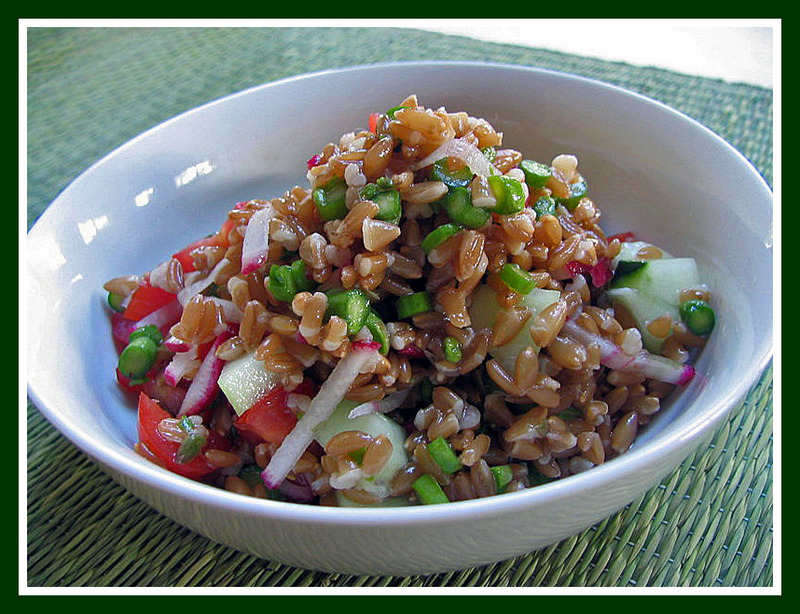 At serving time, mix the cooked farro with the diced tomatoes, cucumbers, cilantro (if using), asparagus and radishes, add more dressing to taste, adjust the seasoning. Comments: A couple of years ago I watched Anne Burrell use raw asparagus as the main ingredient in an unusual salad. She inspired me in this farro recipe. Since the asparagus spears are raw, thinly slice both them and the radishes. If you add some dressing to these two ingredients and allow them to rest while you prepare the remainder of the salad, it will mellow their sharpness. I haven’t given any exact amounts for the ingredients so that you can play with them, using more or less, depending on your own taste. Skip some, add something else (onions, diced olives, capers, mint leaves), and adapt the dressing too: orange juice complements asparagus and farro quite nicely! Always interesting to discover a new grain. I hadn’t heard of this and thought at first it might be Kamut but a spot of googling shows this is not the case. In English, according to Wikipedia, it seems to be called emmer wheat, and in French amidonnier. Anyway, I shall be keeping an eye out for it. Thanks, Sally! I am curious to find out if farro is available in Brazil, maybe one of my friends will let me know. I am also very interested in adding different grains to our meals – I’ve got a bag of red quinoa staring at me from the pantry, need to invite it to play soon! I just love farro; just wish it was easier to find in Utah! I’ve baked with emmer flour, which I think is what is called farro where you are, triticum dicoccum?, is that the one you’ve made that delectable salad from? I’ve never seen the grain for sale here yet. I remember reading about the confusion in terms, some people want to call spelt, farro. Wheat genetics is mostly over my head, I just know it is very complicated! The emmer flour I used was a very soft flour as you might expect, with a wonderful rich colour and gave a sweet and mild taste to the bread I used it in. Hope your husband gets his wish, that looks delicious! I’ve never tried raw asparagus in a salad, that sounds soo good Sally! I had farro for the first time recently. This recipe sounds delicious. I’ve baked with emmer flour, which I think is what is called farro where you are, truiictm dicoccum?, is that the one you’ve made that delectable salad from? I’ve never seen the grain for sale here yet. I remember reading about the confusion in terms, some people want to call spelt, farro. Wheat genetics is mostly over my head, I just know it is very complicated! The emmer flour I used was a very soft flour as you might expect, with a wonderful rich colour and gave a sweet and mild taste to the bread I used it in. Hope your husband gets his wish, that looks delicious! I’ve never tried raw asparagus in a salad, that sounds soo good Sally! I made another salad very similar recently, using “kamut” – now THAT is even more obscure than farro, I suppose – turned out delicious, I should be blogging on it in the next 3 weeks. I love farro and should use it more often, like in this salad! Sounds fresh and delicious. That’s so true about never making the same thing twice. It’s telling when we do make a particular dish repeatedly! Sally, this is all very interesting – someone left a comment on my blog recently that farro salad in Italy is made with spelt grains. I must look out for them and see if we can get anything over here. I adore most grain salads, quinoa being the exception! Lovely lovely salad. It looks so wholesome and refreshing… I live in the Northeast of the US where spelt is easy to find but farro isn’t. I don’t know why. In France it is sold in the natural food stores under the name “petit épeautre” (as opposed to spelt which is simply “épeautre”). I have half-a-pound left from a (very expensive) little bag I got from a great Italian grocery at Chelsea Market in NYC. I made farrotto with the first half. I’ll make this salad with the rest. Thanks for the recipe! Thanks, Pat… will do so! Hi, Megan… indeed, but there are no Trader Joe’s where I live, actually we have two in Kansas City now, but it’s 2 hours from where we live. However, since I wrote this post we moved to Kansas, and our grocery store carries farro almost year around now.